Think you know your homonyms? You've go 16 cards to prove it. Get the deck and drill the cards now . You are in a beginning Japanese class, studying vocabulary, and the teacher says "Hana - in this case it means flower." "Wait," you object "I thought 'hana' was the word for nose?" In English we refer to words that sound the same as homonyms. Strictly speaking, these Japanese words would qualify as the subset of homonyms called heterographs, because they use different kanji, which (in my mind) is different spelling, like the english words 'son' and 'sun.' 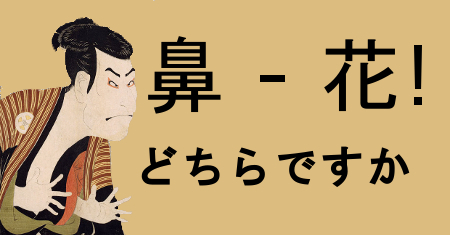 Look up a word in Japanese by it's kana pronunciation, and you may get back words that are pronounced the same, but are not related in any other way. A good example is kikan. There are 23 different words, each with their own kanji, but only seven are common. Here, I have listed them for you. Since these are not frequently used words, I did not include them in the deck of homonyms. I included much more common words like hana (nose) and hana (flower). Try it out and see what you think!